Below you can find the various forms of fishing that are possible on our guided fishing excursions. 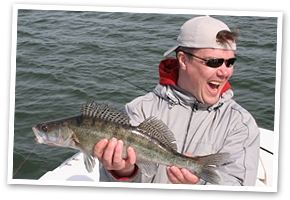 Fishing zander (pikeperch) is possible throughout the whole open water season. After the icecap have melted in the beginning of the fishing season, zanders are typically in the deeper and warmer layers of water. Heavier size jigheads are used to reach the fish in the correct depth. Shoals of zanders are commonly large and the catches can be immemorial. During the spring time when the surface layers of water warm up, zanders seeks into shallow shores and cape head areas. When the spawning time gets closer, fishing is targeted to shallow rock bed areas where the water should be bit bleary in optimal conditions. But when the spawning is ongoing, the actual spawning areas are left alone and zanders undisturbed. However during that period of time the nearby shore areas are good places to fish where the already spawned zanders typically are. 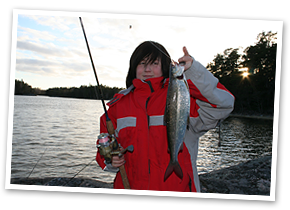 Fishing varies during the midsummer based on the prevailing weather conditions and air pressure. Typically the jig fishing is at its best in midsummer when fishing on lakes. During the end period of summer and closing autumn, zanders are typically found from sea bays, deep areas and shallow straits where the water is flowing. Especially the ability of finding the big ones during this period of zander fishing season in prevailing conditions, is a special skill of an experienced fishing guide. In late autumn fishing is targeted to shallow and very bleary waters where the zanders are seeking for other fish species to eat. 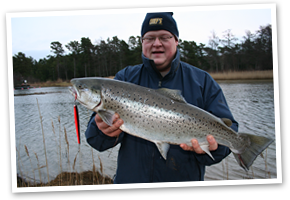 If you are willing to enjoy the beautiful environment at the sea and you are ready to face the challenges set by the capricious sea trout, casting the sea trout is your right choice. Cathing of this specie is not always quaranteed, but even seeing the high jump of strong sea trout before loosing it, is just a breathtaking and unforgettable sight. Fishermen that have even once felt the hooked seatrout on the other end of the line but finally lost it, are often hooked for rest of their lives to this exiting and challenging form of fishing. The feeling and exitement is just huge when the fishermen are getting the contact to the sea trouts. When the fish is on, the actual battle between the fish and fisherman starts. When sea trouts wins the battle, the dissappointment is tangible and that is the moment when the fishing guide is better not to comment anything and just be silent. On the other hand lifting the sea trout weighing five kilos, can be compared to the feeling of winning the Stanley Cup finals. Fishing of sea trouts is targeted to the clear water sea areas. Fishing season starts after the ice have melted and continues to the end of June. Warmer water steers the sea trouts to the open sea where the water is colder. Sea trout season starts again on September when the water temperature gets lower and continues to the beginning of winter when the ice cap starts to form. 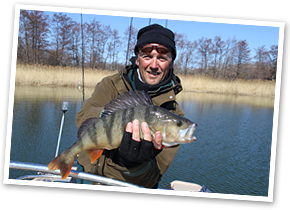 Casting of perch is possible throughout the whole open water season same way as with zander. Big amount of perches are caught frequently when the fishing is focused on zanders but this specie has also its own hot seasons. Big perches seeks into shallow bays near the spawning areas in spring. If you are particularly focusing on big ones, the number of caught ones is not necessarily very high since they are not moving in big swarms. However fighting with big ones when using sensitive and light perch fishing tackle is so exciting that you are ready to have few empty casts once in a while. Fishing of perches is typically happening on shallow straits and near the islets and shoals on midsummer. Perches start to swarm when the dark nights cool the water in the end of summer, which part of the season the best time for fishing the perch swarms. Big perches are typically moving in their own swarms or being in the same hunting areas with zanders. The amount of perches caught in year 2011 was enormous. The magic limit of 1 kg was exceeded totally 28 times. Which lure you should use to catch a perch? 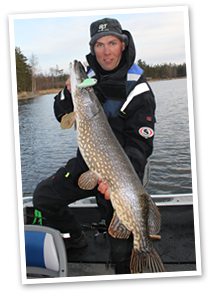 If you want to have a big fish from Finnish waters, fishing of pikes is the most likely choice. Pikes are always possible to catch with casting tackle when the surface of the water is free of ice. However the pikes are rather selective when it comes to the lures that the fishermen are using. This means that the you should have pretty comprehensive set of lures suitable for different conditions. The fishermen that are still claiming that pikes are always striking to e.g. regular tablespoons, have not explored the mental life of pikes. Pike fishing is targeted during the season to bed of reed areas, rock bed shores, flat clay beds etc. Jerk fishing is at its best in autumn when the water level is rising. In case of the weather being so bad that you are refusing even to fetch your mail, it's the time to take you jerk tackle and head for searching the big ones. I personally think that the most fun and maybe even the most efficient form of fishing is the jigging of pikes. The depth where the pikes like to be, defines the size of the jig heads. On shallow waters even floating jig heads are used. One of the most unforgettable big ones was the 10,2 kg pike that my customer caught from 14 meters. Which lure you should use to catch a pike? Typical way to start the open water fishing season is the ledgering of whitefish using a common earthworm. For ledgering you need spinning reel and rod, line, hook, weight and common earth worms. Whitefish are lying near the shores when the water is cold in the spring. Easy way to notice that the season is starting to end, is when the roaches and small perches are starting to be caught. If you are willing to continue the ledgering season after the water have started to warm up, you should move away from the continent and head towards the achipelago where the colder water is. Moving this way can extend the season for few weeks if you have been hooked totally for whitefish fishing. Finding the best whitefish spots is hard work. Shallow beaches, straits and rocky shores are good places to cast the wormbait to the water. The best whitefish spots are often looking very simple and they are based on the currents and the food that whitefish are searching for. Which bait you should use to catch a whitefish?